Love making cotton candy at home for the kids and their friends. The blue raspberry flavor tsste just like the ones you would get from a real carnival. 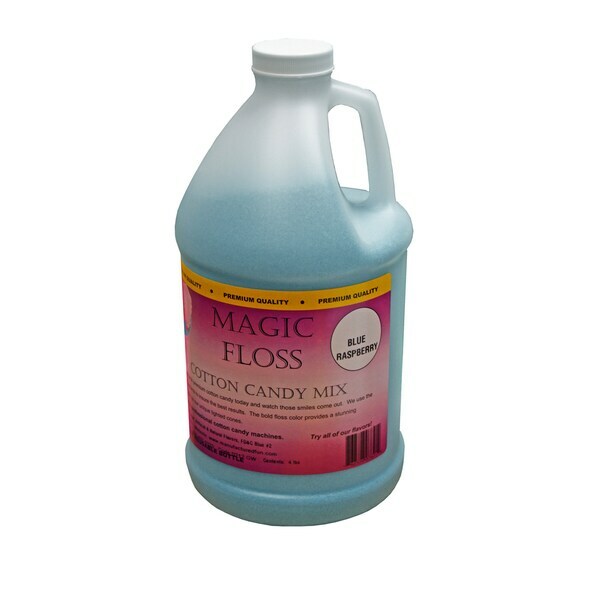 This Magic Floss cotton candy mix is packed in a sealed, easy to pour bottle. Simply unscrew the bottle and pour directly into the spinner head to make your sweet treats. If you want fluffy cotton candy that tastes delicious this is the floss for you. It will last a very long time. It does not take much at all to make the cotton candy. This is a wonderful product and will buy again. we bought this for a waring pro cc150 cotton candy maker we bought at overstock.the flavor is as good as the floss used at the fairs.this will make a lot of cotton candy! Just like the carnivals without the higher cost an smaller amount. Good quality and value, and easy to use. So many ways to use save and enjoy. As a treat, hosting parties, kicking up sleepovers to A status. Used in a smaller home cotton candy machine with no experience and turned out better then expected. "how many cones will one bottle serve?" How many cones will depend on the amount of mix you use. Customers have commented that 1 teaspoon makes 3 servings.